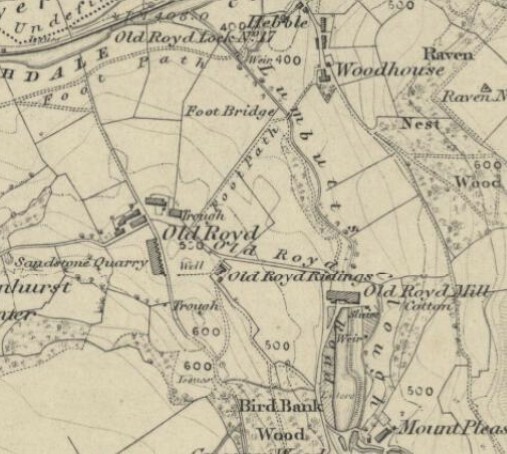 I suppose it's obvious why I am interested in a place called Oldroyd, or as shown on maps from earlier times, Old Royd. Information about the place might be of interest to those of a similar bent. 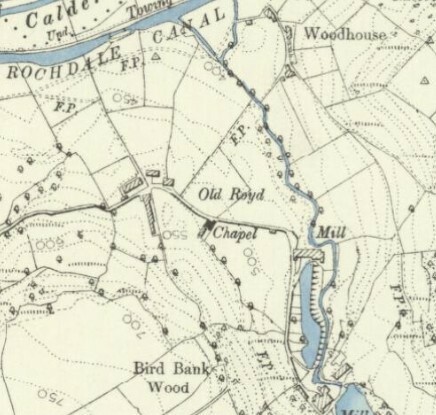 The hamlet of Old Royd, a few cottages and a farm, could be the origin of the family name. It fits the explanation -- old clearing or field -- so it might as well be the ancestral home. More likely, it is a pure coincidence, as the name Oldroyd may be from several derivations. I hope you enjoy this brief narrative, please email me if you can add to the tale. 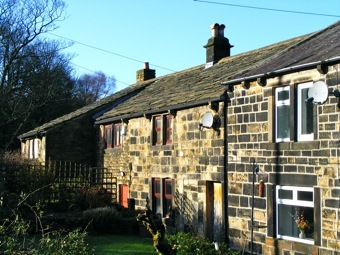 Oldroyd comprises a farm, converted barn, two rows of cottages and for a time, a Methodist Chapel. The farm is a Grade 2 listed building, parts dating from the early 18th century. At this time settlements were located on the "shoulder" of the valley and probably replaced wooden buildings on the same site. 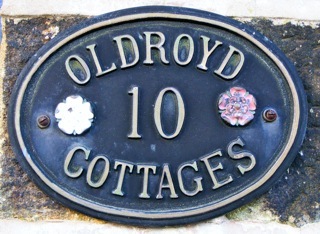 The first cottages at Oldroyd were probably built at around the same time. Some of these cottages, along with the farm, show evidence of hand-weavering: the evidence being the characteristic first floor windows. The row of Oldroyd Cottages was probably built in the late 18th or early 19th century in association with the construction of the nearby Oldroyd Mill, which was first recorded in 1794. Looking at old maps, this row of cottages appears to have been extended in the 19th Century. Oldroyd Mill would originally have been water powered: the smaller building on the right. At some time the mill was extended and later two floors added, probably when steam power was introduced associated with powered looms for weaving. 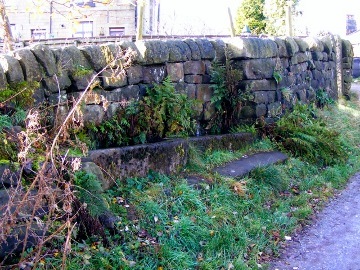 The mill lay in Lumbutts Clough. Clough is a word used particularly in this part of the Lancashire/ Yorkshire Pennines to describe a narrow valley or ravine running down from the moors. This valley is particularly illustrative of the development of the wool and cotton trades at the start of the industrial revolution. The water in the clough provided the basis for a transition from hand spinning to a more mechanised, mill-based industry driven by water power. Later, in the early 19th century, mechanised looms driven by water and then steam power completely changed the industry. Water from the valley stream was held in lodges (reservoirs, possibly derived from a "place to lodge", that is "keep" the water). The valley usually provided an ample supply of water, plenty of fall with which to drive the waterwheel and suitable building materials in the form of the local Millstone Grit: these and the prevalent damp climate making it an ideal location for the mill. In the mill, the waterwheels powered the spinning and weaving machinery. A particularly good example of this is Lumbutts Mill higher up the valley, where the remaining tower once housed 3 waterwheels driving machinery in the mill. In 1799, the first section of the Rochdale Canal was opened. The canal lies just to the north of Oldroyd, in the valley bottom, and includes Old Royd Lock (number 17). The canal was opened fully in 1804, providing access through Manchester to the port of Liverpool and the Lancashire Coalfield. Subsequently, in 1841, the Leeds and Manchester Railway was opened, further improving the transport connections of the site. It is likely, over time, this lead to the introduction of steam power, the extension of the mill and the construction of the traditional mill chimney. All has now vanished, as Oldroyd Mill was disused by the 1st World War and demolished in the 1920's. 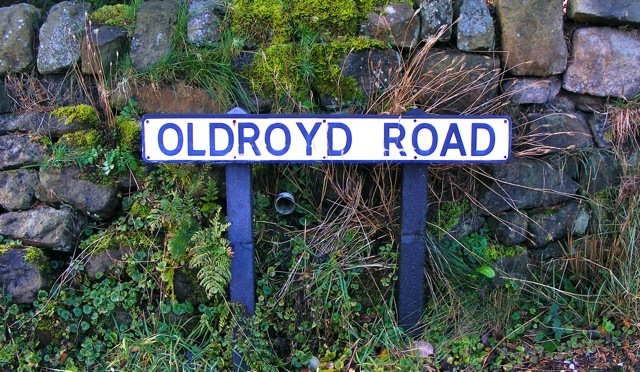 However, moving back in time, the area around Oldroyd also contains the marks of an earlier transport, the pack-horse. 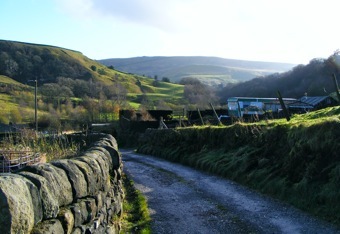 The hamlet is on the route of pack-horse trains passing over the Pennines between Lancashire and Yorkshire. Within the village itself, there remain the horse troughs used by the ponies on their journey up the clough. Higher up the valley a flagged path, the Long Causeway, marks the route over the moors. Whilst these paved ways may have helped the pack-horse, they also provided a guide for workers travelling across the moor at night, feeling their way through the marshy ground by keeping their unshod feet on the flags. Reading the local history of the region one cannot but be impressed by the Quaker, non-conformist and liberal independence of the local inhabitants. Oldroyd Independent Methodist Chapel is a typical example of a breakaway group of Christians common in the area. 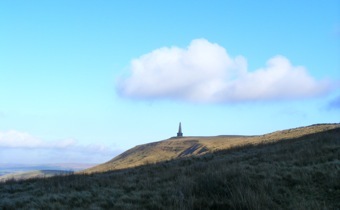 Unlike many prominent landmarks, the tower on nearby Stoodley Pike was built to mark the outbreak of peace in Europe, not to celebrate ventures within war. 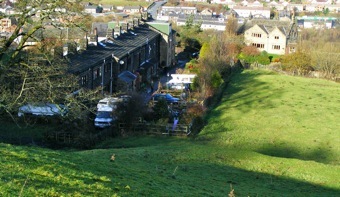 An overview of Oldroyd showing one row of cottages and the farm. Another row of cottages at Oldroyd, possibly older. 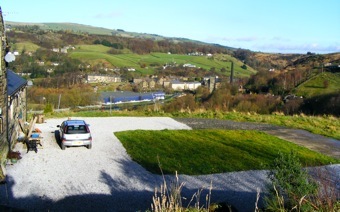 A view of the Calder Valley and Rochdale Canal from Oldroyd. A view up Lumbutts Clough towards Mankinholes. A pair of horse troughs. Spinning the Web : this site gives comprehensive coverage of the history of the cotton industry in Lancashire and this part of West Yorkshire. The digitised material describes in detail the manner in which the industry developed. 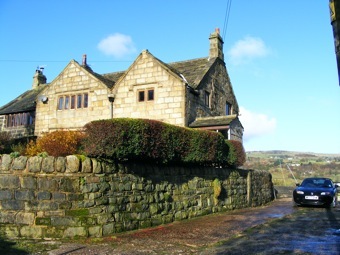 Todmorden and Walsden : this site contains a staggering amount of information about Todmorden. The history of the various mills if well covered, but the whole site has much fascinating material. "Todmorden Riots" is also well worth a read as the disturbances started just up the road in Mankinholes. An interesting point is that although there are lots of lists of names in this resource, I have yet to see an Oldroyd. 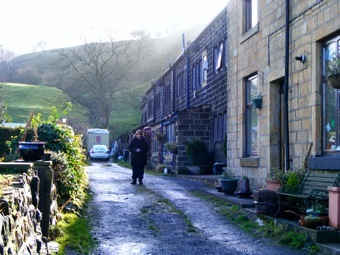 Acknowledgement: The image of Oldroyd Mill is linked from the "Todmorden and Walsden" website. Fieldens of Todmorden: a Nineteenth Century business dynasty by Brian R Law (ISBN 0 946571 26 0). A very good book that describes the rise and fall of their business and thus provides much background information on the industrial revolution in this area. The Fieldens owned mills in Lumbutts Clough, but not Oldroyd Mill. Yorkshire Cotton: The Yorkshire Cotton Industry, 1780-1835 by George Ingle (ISBN 978-1859360286). An interesting account of the development of the industry and a gazetter of mills. A selection of old maps covering the area are available at the National Library of Scotland website. Here is the map surveyed in 1848, shortly after the railway arrived in the Calder valley. The blank space on the map is Lancashire !. At that time the Ordnance Survey prepared maps on a "County" basis. Better versions of the photographs can be found at Picasa.